Warning: Life changing post ahead. This cupboard kept making me sad. I couldn’t find anything. Stuff would attack me when I opened the doors. I kept buying things that I didn’t need. I couldn’t reach my sprinkles. It’s a sad day when you can’t reach your sprinkles. I decided to take matters into my own hands. Because, honestly, who else was going to fix this hot mess? Nate? Ike? Yeah, I took matters into my own hands. The spices are now organized alphabetically. The extracts are located together. Most importantly, I can reach my sprinkles. Can I get a hallelujah? We still have quite a few bottles of liquids that make the cupboard look a little more cluttered than I would like. (I should have removed them for the blog photos but I like to keep it real while gettin’ spicy with it.) The liquids are now organized and I can see what I have. Note to self: do not buy Karo syrup. I keep thinking about starting an emergency preparedness kit. I sure hope Karo syrup is on the list because I have an amazing head start on that one. I may be the most unorganized organized person that I know. Nate informs me that there is no way he is going to put spices back in alphabetical order. I think he will come to love the alphabetized spices and he will want to make sure they continue to stay that way. That’s how it works with husbands, right? He also wanted to know why I needed to replace the one turntable we owned with a matching bamboo one. He wanted to know if I didn’t have a blog would I replace it. I answered yes and yes and I hope you don’t wake up on the wrong side of the universe again tomorrow. 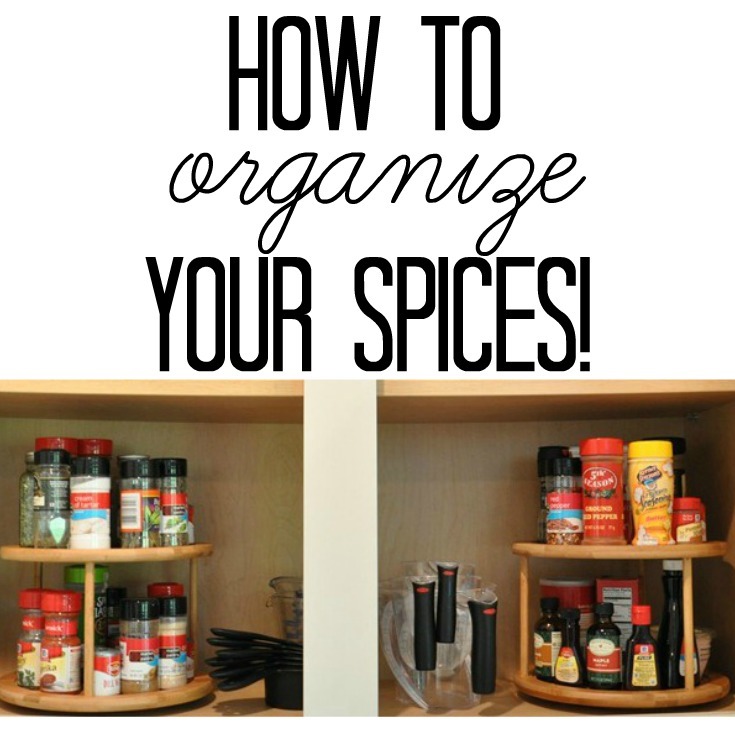 Little things like pretty and organized spice cabinets make life so wonderful. Any life changing organizational tips to share? Can you make it out of Wal-Mart with only the items on your list?